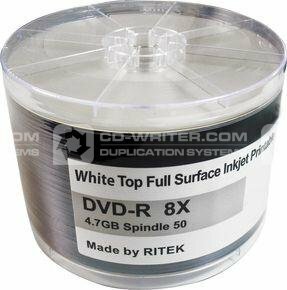 These Ritek Inkjet Printable DVD-R are amongst the most popular discs we sell. We have been selling Ritek DVD media for over 10 years and use it for all of our internal testing and duplication purposes. We find it has the lowest failure rate and the highest compatibility of all media available at a similar price. The result of using the Ritek Inkjet Printable DVD-R with Primera, Microboards, Epson, Rimage and StorDigital Printers and Duplicators are outstanding and you will be astonished by the outcome of the burn and print quality. Authentic Ritek discs are a low-cost duplication solution which are perfect for home, business and professional purposes and fantastic value for your money. Our workshops and duplication facility plays host to every known manufacturer and model of disc printer and we use Ritek discs as a bench mark disc to ensure the correct operation of the printer mechanics and the print quality. Not only are they great value, but their A-Grade rating helps ensure you only get discs that have passed stringent quality checks during the manufacturing process. With a white full surface printable area and maximum burn speed of 8X, these 4.7GB DVDs are a great option for use in all environments. Suitable for use in a Duplicator, Inkjet Publisher, PC or Mac. In short, if you need a quality disc that performs to the same high standard time and time again whilst preserving your wallet, then you cannot go wrong with Official Ritek product from CD-writer.com. Ritek . White . Full . Surface . Printable . 8X . DVD-R . 100 . PACK .